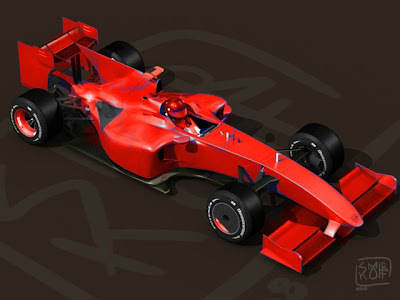 (Update): That spec drawing was not too far off: It's called the F60 and yes, thar rear wing is a shocker. there is some interesting things going on there with the sidepods and extractor...can't wait to see more details. The rear wing is the only thing that looks really weird but I guess they will all have that this year. I was wondering why they allowed the diffuser to extend further rearward, but after seeing the relative sizes of the F/R wings, I guess it was the only way to balance the car. Diffuser exhaust must be much frendlier to overtaking than wing wake? If you look on the other post, with the Videos from Ferrari, there is an interview with Nikolas Tombazis where he says, essentially not to expect DRAMATIC difference in overtaking. THere will be an improvement but not as big as perhaps people are expecting.